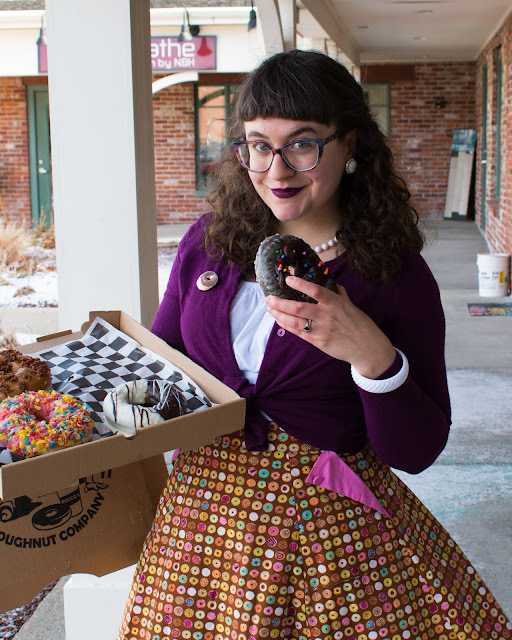 I have an ongoing list of favorite donut shops in the area and tend to try whatever shop I am near whenever I travel so you can only imagine my excitement when word got around that we were getting our very own gourmet donut shop in town. Rocco's Doughnuts originally opened in Milbury, MA a few years ago and was wildly successful. After the rise of PV Donuts in Providence, Massachusetts was in dire need of a funky donut shop with crazy flavors. 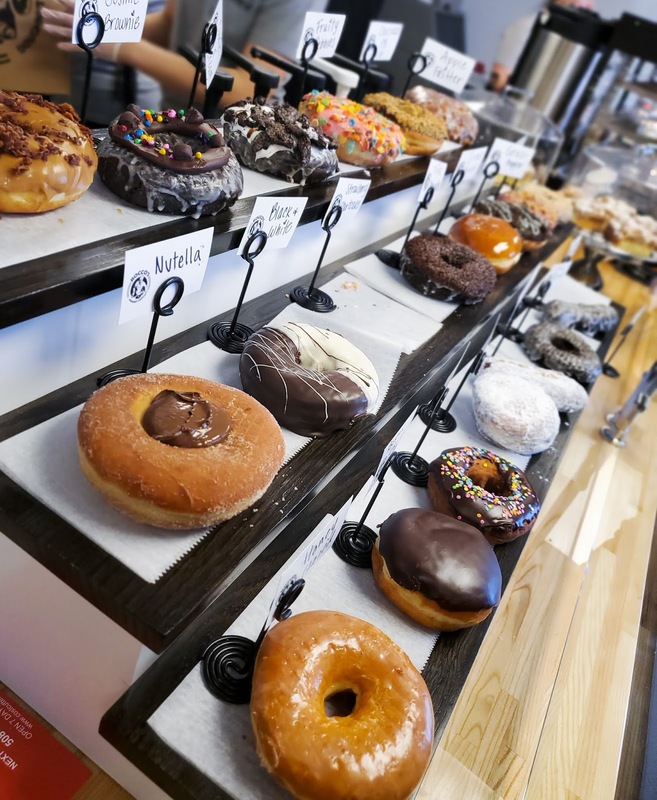 We have AMAZING donut shops in Boston (Blackbird Donuts, Kane's Donuts, and Union Square Donuts to name a few) but they're in the city - a good 45-60min away from my everyday life. So getting Rocco's in suburbia land was exciting. Then they announced last year that they were opening a second location and when they revealed it to be just 9 minutes from my house, I lost it. 9 MINUTES FROM MY HOUSE! Goodbye, waistline. 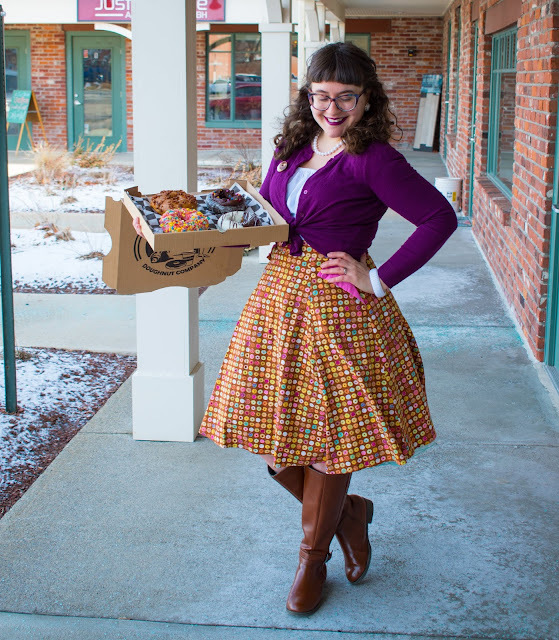 Of course, once they shared their grand opening week, I made plans with Red to go get us a box. We sure do love our food adventures. 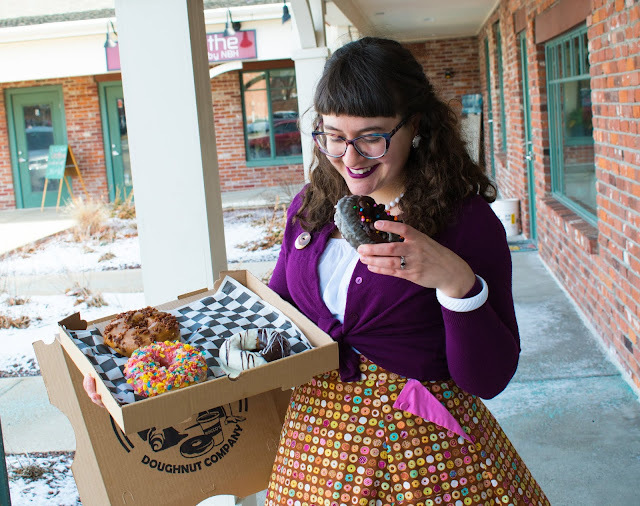 Fun fact: Red came with me to try PV Donuts the first time, too! We got ourselves up early on Saturday morning and headed down the road for some fun. Of course, as luck would have it, the day was a typically weird New England day. It started out overcast and snowing and then turned into a harshly sunny day with a lot of my favorite - WIND! It made taking these photos amusing but also insanely annoying. 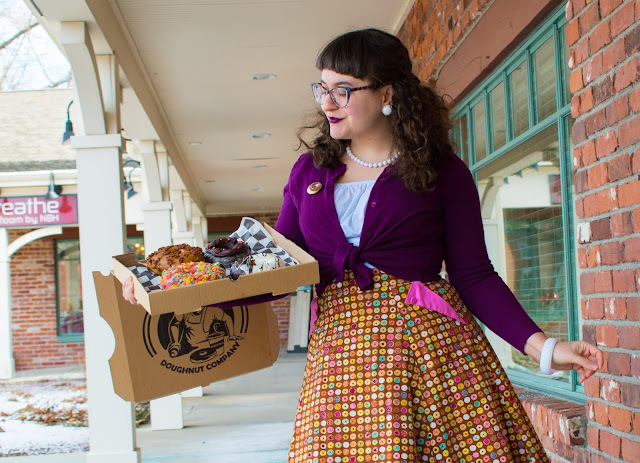 In some of the photos we snapped, with my hair blowing back and my skirt all blown about, I looked like some sort of superhero mid-fight, holding a donut box. 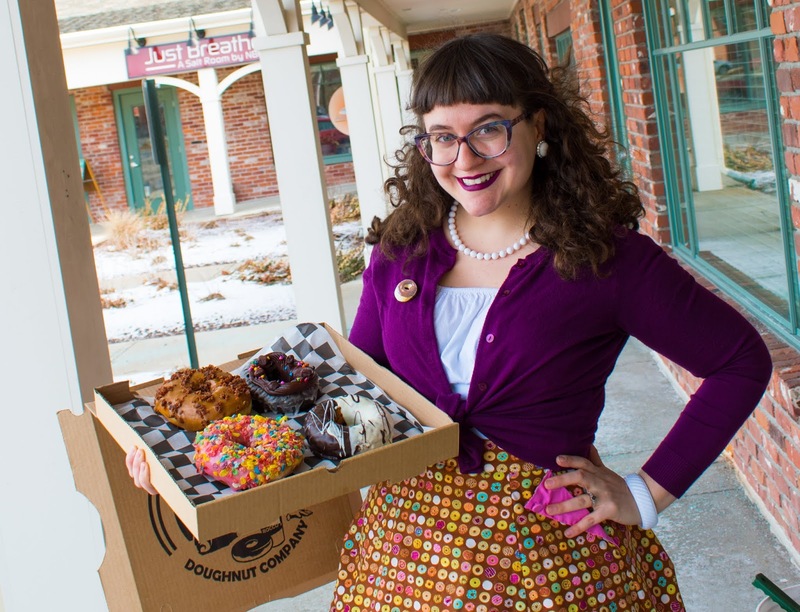 DONUT GIRL TO THE RESCUE! You KNOW your gal dressed appropriately - I wear my Heart of Haute donut skirt quite a bit but ALWAYS when donuts are involved! 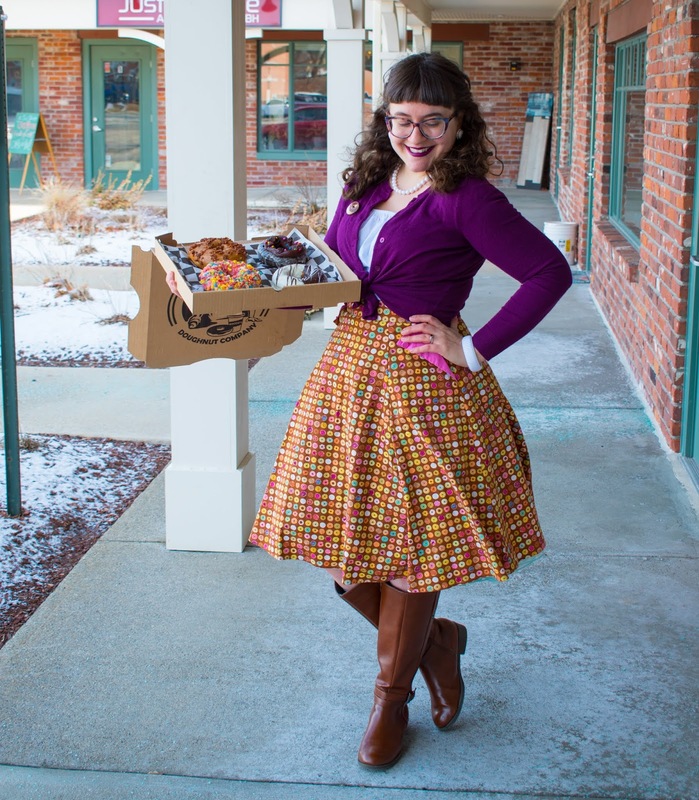 I could think of nothing else to twirl in while holding a box of Rocco's donuts. So how are the donuts? Delicious. My favorite of theirs is Fruity Pebbles - which has SUCH a surprisingly strong punch of Fruity Pebbles flavor. I never usually go for the fruity ones but man, it's fluffy, sweet, and scrumptious. Rocco's offers many different types - cake like, fritters, raised, filled, sticks. You really can't go wrong. Their variety of flavors means everyone will find something they like - even if it's a simpleton looking for a plain glazes. The only thing missing was a vegan flavor. Now, I didn't ask the staff if any were vegan (it was a BUSY shop!) 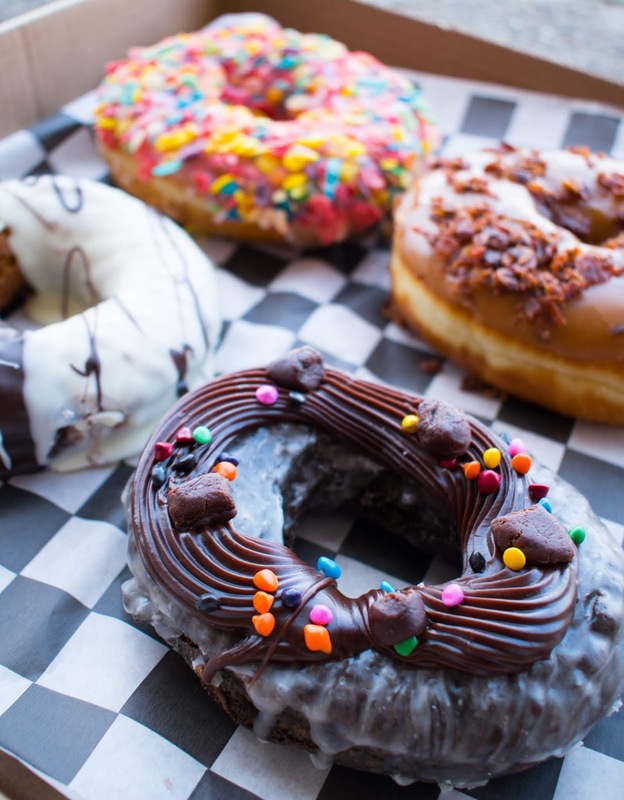 but Rocco's doesn't label their donuts nor call out whether or not they have any vegan flavors when they release their menus. 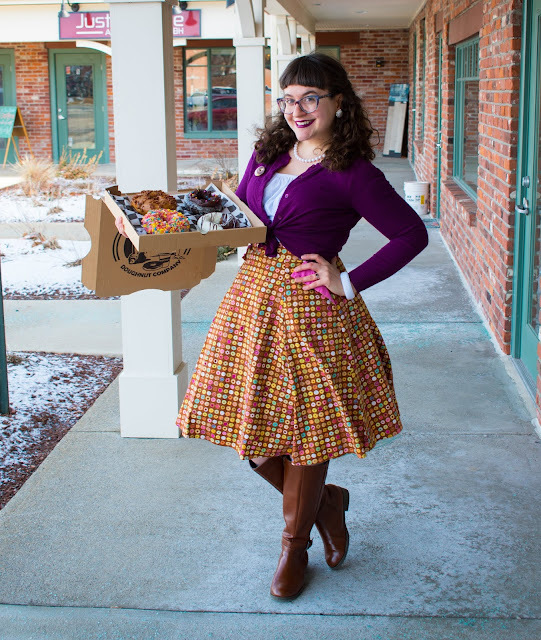 It doesn't surprise me but baked goods like donuts are fairly easy to vegan-ize. 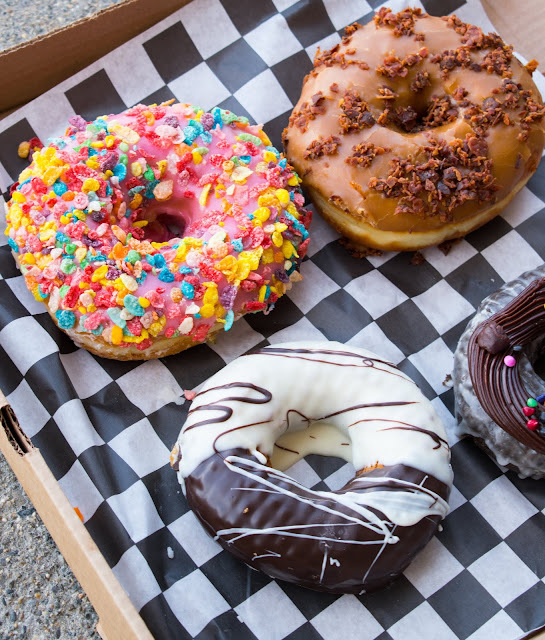 It'd be cool to see them add one vegan flavor a month like many other shops do. Their menu also changes every month so it seems like a no-brainer! How was the experience? Well, a bit chaotic. 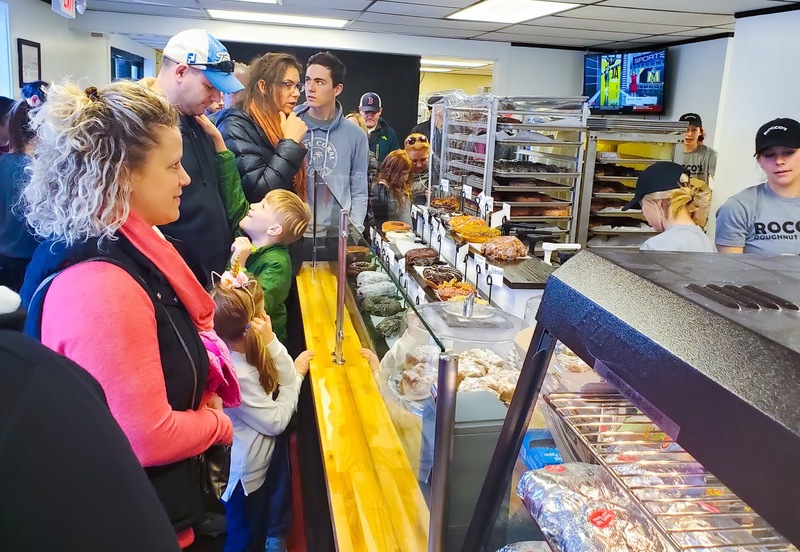 I assumed that even though it's a small shop, it'd be a well-oiled machine considering Rocco's has a location in Millbury that they've been running for a year now, yet it kind of felt like this was their first rodeo. The register is stuffed in the corner, where there is no exit, so once you pay, you then have to squeeze back through the crowd to the door. I literally held my donut box up above my head. Still, the line moved pretty quick and the staff behind the counter didn't seem bothered at all as they filled those pizza boxes up with the goods. I think as it settles down in weeks to come, it'll be one of Westborough's gems! Wow...look at all the people there...that's crazy. I do love donuts (what's not to love), but I'd probably go when there wasn't a line like that..ha ha!! 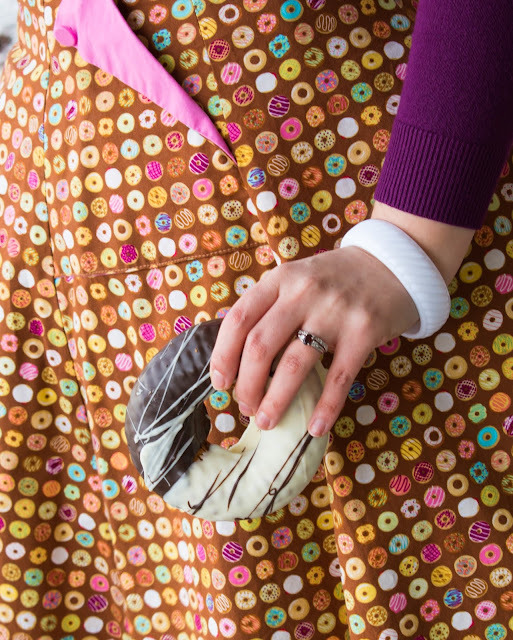 And how adorable that you have a donut skirt. I guess that shouldn't surprise me. You really look so cute on this dress. However, I like this cake or chocolate very much. 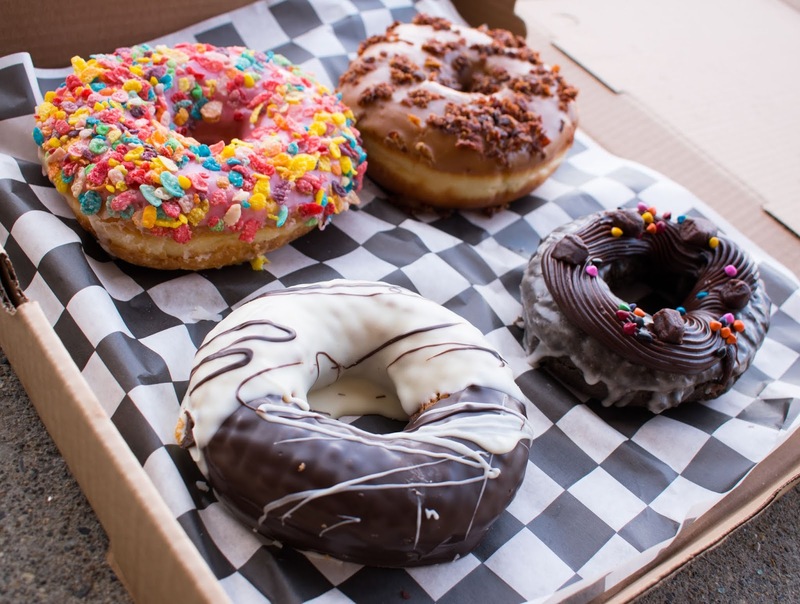 Those donuts look SO good!! That's so exciting that they opened a shop super close to you! 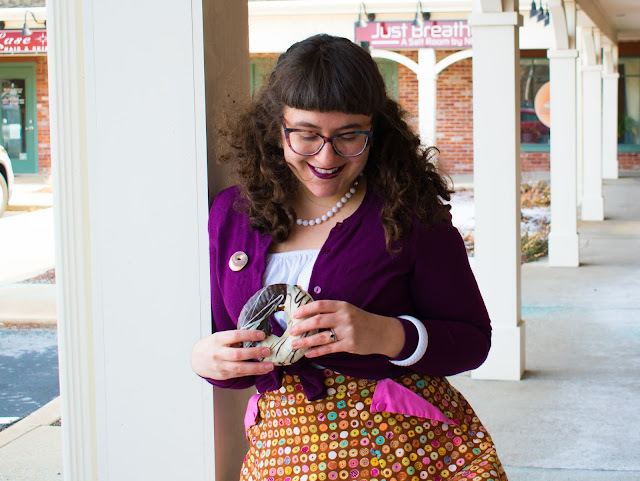 Of course the adorable skirt you wore to check out the shop was the perfect choice. Now I need a donut, haha. They look amazing! 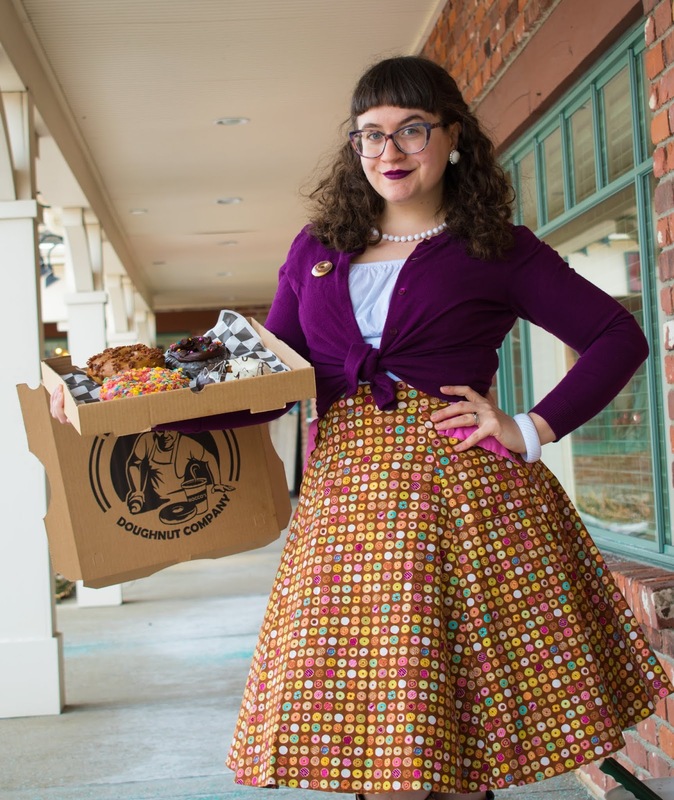 I love that you wore a donut skirt for the occasion!